Making the old look new - Again! The owners and their design consultant Sandra Ford pay homage to the heritage of a classic Clayton residence. An ethereal landscape by Ruth Mayer lends color to living room's warm, chocolate-to-cream palette. 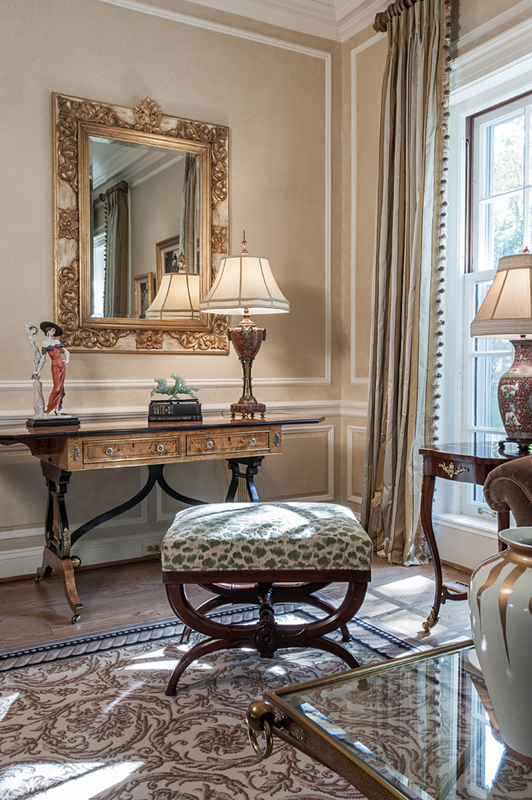 Tucked into a sunlit corner of the living room are a small drop-leaf, lyre-legged desk and an antique bench from Clark Graves. Suspended above the exquisitely ornamented E.J. 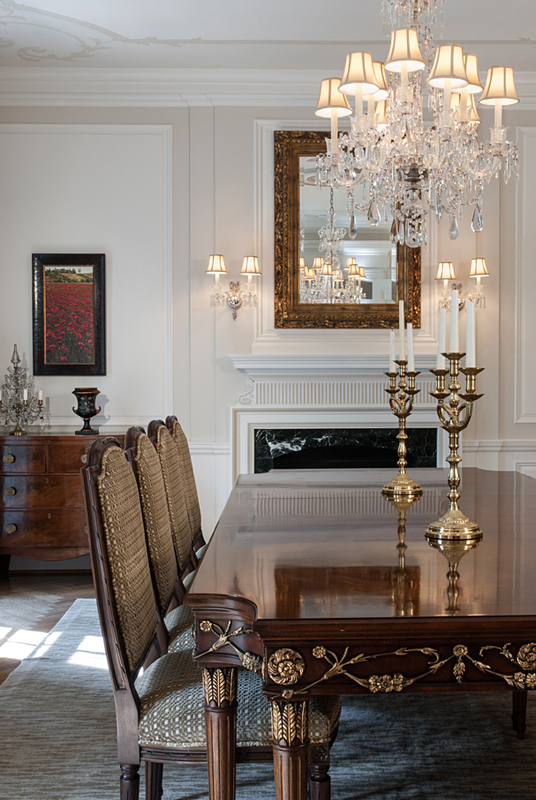 Victor dining table, the crystal chandelier is original to the home. The table can be extended to 11.5 feet and is complemented by antique-finished beechwood Windsor chairs, a single-bonnet Baker display cabinet and early 19th-century walnut chests from Clark Graves Antiques. 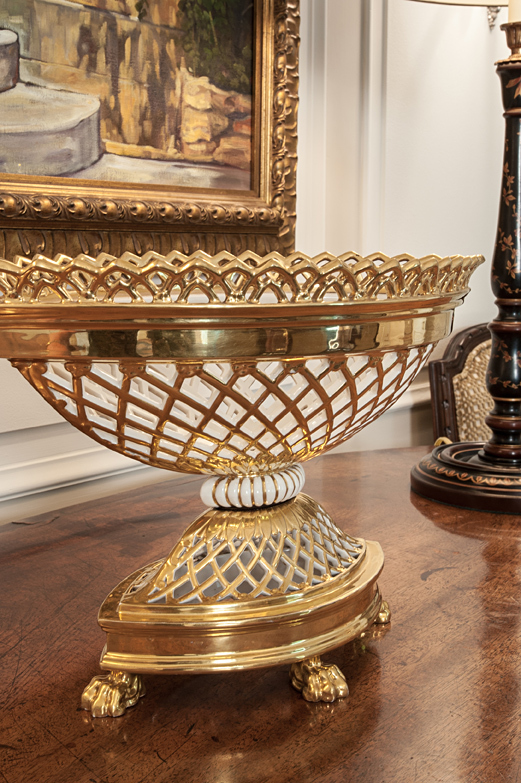 An antique French compote in porcelain and gold accents the dining room's elegantly curved, antique bow-front sideboard. 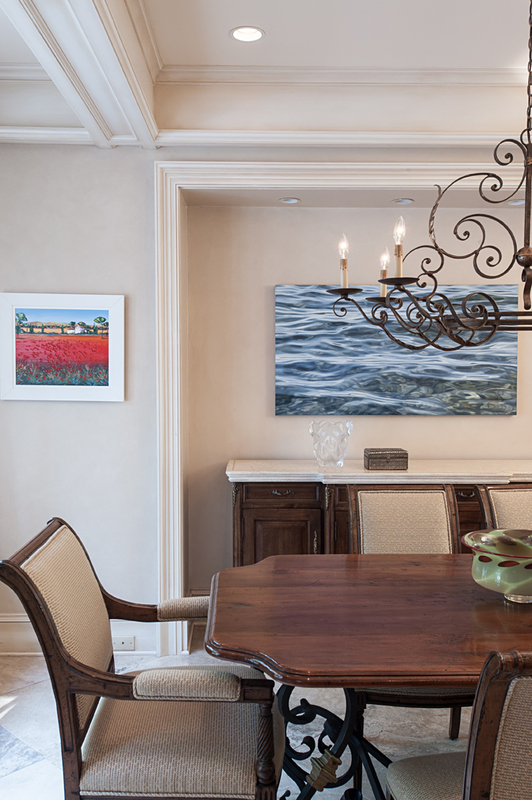 In the bayed breakfast area, a graceful Fine Art chandelier is suspended above a unique French walnut table from Jules L Pass Antiques that features contoured corners, a double-framed edge and a heavy wrought iron-and-brass base. Bathed in natural light, the family room was added by the new owners and conscientiously designed to reflect the home's architecture. 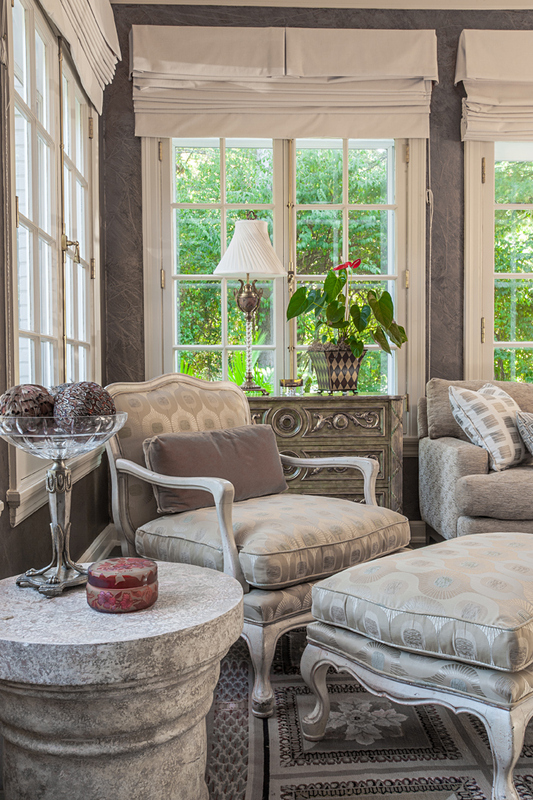 Linen valances and Roman shades beautify the solarium's original French casement windows. “We’re the caretakers for this home and will pass it on to another generation.” That’s the commitment made by these homeowners on moving into their magnificent three-story Colonial in 1999. Located in a Clayton neighborhood that celebrated its centennial in 2013, the residence was built in 1927-28, designed by renowned Chicago architect Chester H. Walcott, and holds the distinction of a listing on the National Register of Historic Places. When house hunting, the couple was first attracted to the neighborhood, which they consider “one of the most beautiful in St. Louis.” Purchased from the original family, the home itself featured generous upstairs bedrooms, an architectural innovation introduced in the 1920s and a must-have for the new owners. “What’s wonderful is to take an old home like this and make it efficient, with all the modern amenities,” the husband explains. Although some modernization had been done previously – an extension added and the baths brought “up to speed,” adapting the home to the couple’s contemporary lifestyle while preserving its historic integrity required, “a lot of work behind the scenes,” he adds. Phase one: The initial renovation took approximately nine months, starting with the installation of geothermal heating. As construction progressed, the goal was to retain the home’s original spaces, moving only certain rear walls to open the kitchen/breakfast area. Subsequently, a spacious, sun-filled family room was added, overlooking the newly landscaped outdoor entertainment area and freeform pool. Anyone who’s undertaken the authentic renovation of a fine home built during this era can relate to the inherent challenges – in this case, a slate roof, two-foot-thick exterior masonry, thick plaster interior walls backed with metal sheeting and artisanal cast-plaster moldings.The difficulties, however, were far outweighed by the home’s stunning architectural elements, including its original oak floors, elaborate archways and lintels, picture frame detailing and glittering chandeliers. Woodwork was stripped to its original first-growth pine, the archways were emulated throughout and creative thinking resolved whatever complications arose. For example, set on bedrock, only about one-fourth of the home has a basement underneath. Although ideal for a wine cellar, the space was dimly lit, and the plaster ceiling was a nightmare. The solution was to spray the surfaces with foam, giving the space a unique “wine cave” appearance. The garage presented another issue. One of the first in the neighborhood built for automobiles (nearby homes had coach houses for horse-drawn carriages), the tall, narrow doors were designed for Model T’s and a test of the new owners’ driving skills. In this instance, heritage took precedence, and the garage was left intact, with the overhead servants’ quarters converted to the husband’s office. 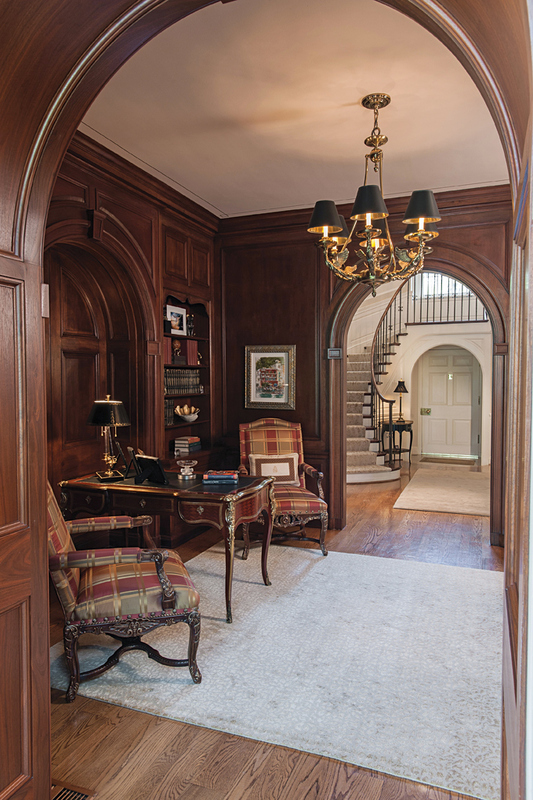 Phase Two: Refreshed for 2014: Soft-spoken and thoroughly attuned to her clients’ tastes, Sandra Ford has been continuously involved in the home’s interior design over the years. After more than a decade, though, it was time to revitalize the décor, and she’s currently putting the final touches to a room-by-room update from traditional to transitional styling. Original to the house, the foyer’s majestic curved staircase showcases a graceful walnut and wrought-iron balustrade. Sandra removed the wallpaper, enhancing the airy quality of the space, and chose custom-made Tibetan Lapchi carpeting for the staircase runner and landing. Adding visual interest, a late 18th century mahogany gateleg card table from Clark Graves Antiques displays a Chihuly glass piece, and two vivid paintings by St. Louis-based artist Michael Hoffman flank the arched entrance to the adjacent library. Fully paneled in rich walnut, the library is dominated by a leather-topped, ormolu-trimmed French writing desk and carved desk chairs, bronze-glazed and upholstered in a dignified plaid. To the right of the foyer is the formal living room, where Sandra made an elegant design segue with matching short sofas positioned at each end of the room and upholstered in warm brown antique striae velvet. Trimmed with ball fringe and crystal, the subtly striped draperies are slightly puddled, and two French chairs, antiqued and covered in a windowpane raw silk fabric, blend beautifully with the full-size Wilton rug. Cocoa-toned leather wing chairs bracket the fireplace, and additional furnishings include another gateleg card table, a drop-leaf lyre-legged desk inlaid with burled yew, and a tasteful array of antique tables and lamps. Off the living room, the solarium’s slate-tiled floor and French casement windows are all original. 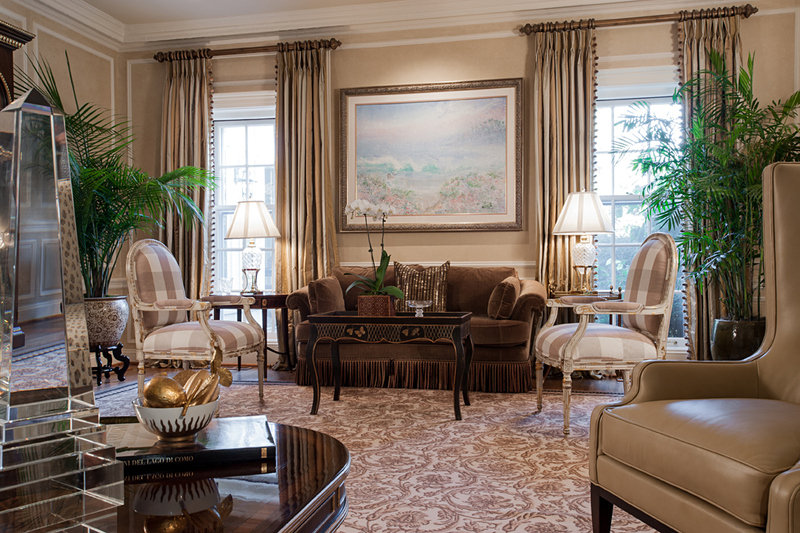 “This room’s fabrics were chosen to represent the transition taking place and to complement the rug,” Sandra commented, indicating the rug’s floral-square needlepoint pattern. The sofa is upholstered in a tone-on-tone embossed striae fabric, two oversize Louis XVI chairs in a lustrous Robert Allen fabric and a large hand-forged table invites board games or casual snacks. With its gleaming herringbone-laid oak floor, the dining room creates an elegant ambience for formal meals. Seating up to 12, the table is an E.J. Victor masterpiece with mahogany solids, walnut veneers, and ornamental apron onlays. 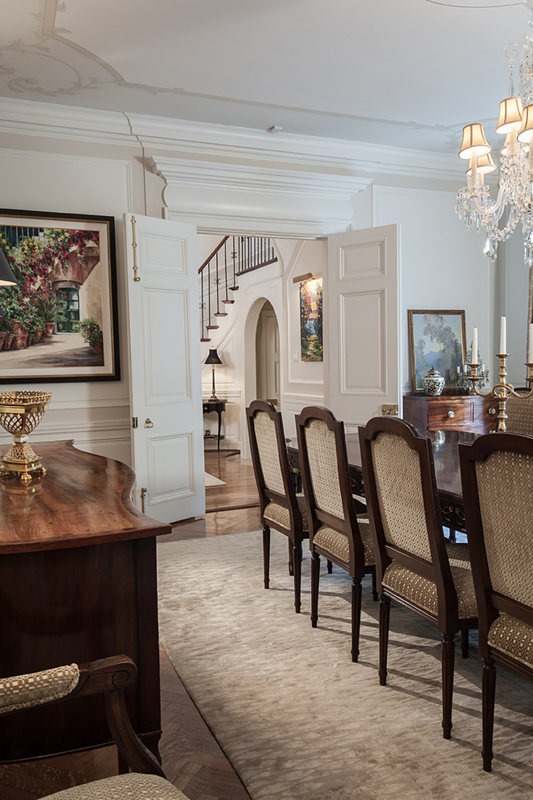 The European beechwood dining chairs were upholstered in a new velvet-&-linen fabric by Lee Jofa; Schumacher silk draperies, with crocheted edging and crystal trim, line the casement windows; and Barbara Barry’s carpet design inspired the medallion and ceiling treatment by artist Roland Breckwoldt. The only significant structural addition, the vast family room further demonstrates the owners’ respect for their home’s architectural styling. Fixed, wood-clad casement windows are topped by a classic clerestory, and the arch motif is faithfully repeated. “Casual, but dynamic,” the pendant-trimmed chandelier has floret bobeches, and the silk-&-wool rug is woven in a traditional Lapchi pattern. Surrounding an Asian granite-topped cocktail table are a Baker sofa covered in neutral-toned velvet, armless chairs in a sophisticated linen/cotton ticking, and club chairs that swivel for conversation or TV viewing. As time marches on and another New Year is launched, it’s reassuring to know that “caretakers” like these will continue to preserve St. Louis’ noble architectural legacy.